My first time giving Zebra nails a go, I'm thinking leopard print next. I used the Models Own/Wah Nails pen which I've kind of neglected since I bought it. Don't really like the nib but the brush is great. Defintely going to buy some brushes so I can use all my other nail polishes for nail art.I really need to buy a white nail polish so I can do real zebra stripes. I'm really loving this H&M polish that I bought the other day. Amazingly it only took one smooth coat for it to become opaque! 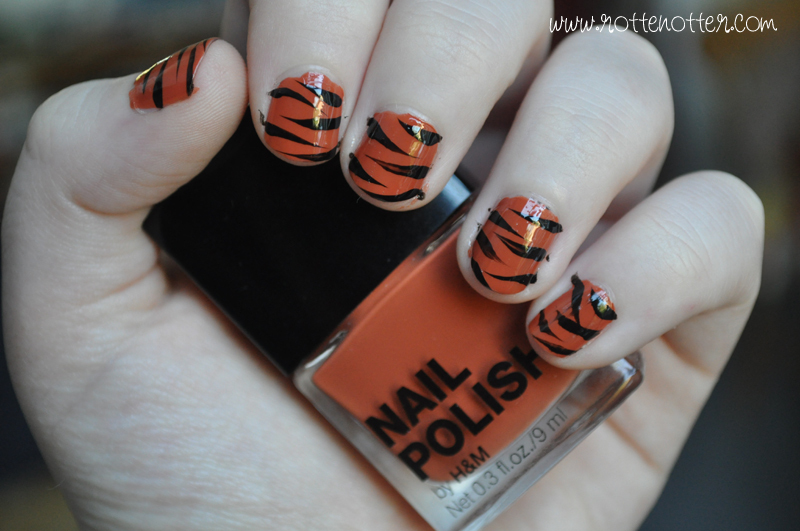 It's "looks great on you" and I currently have it on my toes toe, with the same tiger stripes one my big toe. Not usually one for being matchy matchy but I like it! Wow they look stunning, what top coat did you use? They look so shiney! Wow, you are amazingly talented!